Peter Hawkins will be speaking & signing books at 4 p.m. at Summit Therapy on April 6, 2019 before the 100K packet pickup. 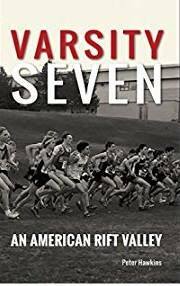 Varsity Seven chronicles the true story of Spokane, Washington's running scene from 1947 to day. What football is to the south, cross country running is to the northwest. And in Spokane, Washington cross country running is king. Each fall thousands of elementary, middle, and high school students traverse the roads and trails, training and competing for their chance to win. Just as some of the greatest Kenyan runners in the world come from one small town, in an area called the Rift Valley, Spokane continues to supply some of America's greatest runners. The Greater Spokane League (GSL) is comprised of 10 teams. Five of those high schools, half of the league, have competed at the coveted Nike Cross Nationals since the inaugural race in 2004. Since 1979 Spokane has sent male or female distance runners to 24 of the 38 Foot Locker National Championships: that is over 60% of the time one town has been represented on a National level. There are over 266,000 male high school distance runners and 226,000 female high school runners comprising over 29,000 teams in the United States. The GSL is a statistical outlier in every respect. What makes this small city a Rift Valley of American Distance Running? By delving into the history of the athletes, coaches, volunteers and families that have set this city apart the answer becomes clear. Varsity Seven is more than just a story of top teams and times. It is the journey of the Hawkins family. From 1993 to 2010 these seven children competed during one of the most competitive eras and in one of the most competitive leagues in the country. Come learn about running in the inland northwest.